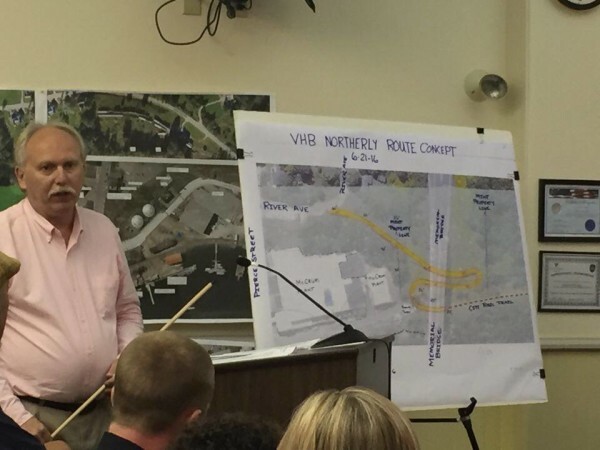 Residents and officials debate the use of eminent domain to connect two recreational trails in the city on Tuesday at the City Hall council chambers in Belfast. Belfast City Planner Wayne Marshall shares a map of the "Goat Path" during a public hearing about the city's proposal to purchase an easement by eminent domain on Tuesday at the City Hall council chambers in Belfast. 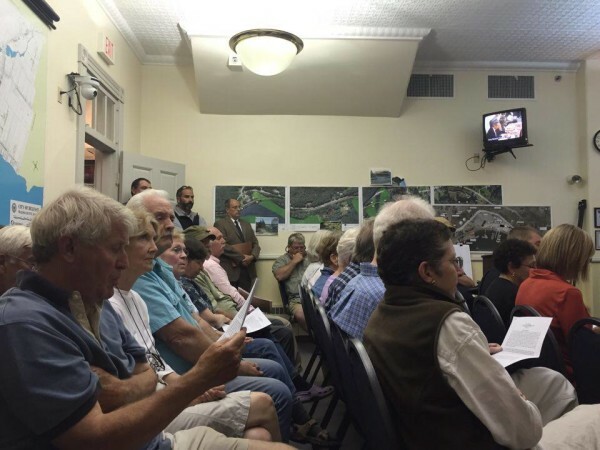 BELFAST, Maine — It was standing room only Tuesday night in the Belfast City Hall council chambers as residents gathered to debate — at times passionately — the city’s controversial proposal to use eminent domain to purchase an easement across privately owned land to connect two local recreational trails. Earlier this month, city councilors unanimously voted to pursue eminent domain to get the easement across a 700-foot-long strip of land owned by the Penobscot McCrum potato processing plant. Belfast officials have said that they have been talking to owner Jay McCrum for the last five years about the city’s desire to get across his property in order to connect the new rail trail with the Belfast Harbor Walk. But McCrum maintained Tuesday night his belief that he was blindsided by the council’s eminent domain action. The new rail trail, which stretches for 2.3 miles along the Passagassawakeag River, has been actively developed by the city since 2010 and has been under construction since 2014. The city would like to connect it with the Harbor Walk via the shortest, flattest route, which travels along the river right next to the McCrum property. The city has offered to purchase the easement for an appraised amount of $55,000. McCrum said again at the hearing that safety is his big concern, because of the proximity to propane tanks, to the company’s ammonia system and to trucks that make deliveries many times per day. On Friday, June 10, he offered city officials a counterproposal of a free easement across the northern part of his property and an additional $25,000 to help build a path down the steep hillside there. But Belfast City Planner Wayne Marshall on Tuesday told the 50 or so people in the room that the “Goat Path” is not going to work. The hillside under the Route 1 bridge, on land owned by the Maine Department of Transportation, has a grade of more than 30 percent. Marshall said that he asked engineers to look again at the “Goat Path” to see what it would cost to make it accessible, and he learned that the cost of engineering and construction would be more than $400,000. After hearing from officials from both the city and Penobscot McCrum, residents came forward to speak, with many acknowledging the seriousness of taking an easement by eminent domain. Many others who spoke agreed with him. Some said they believed all safety concerns could be addressed, and many emphasized their belief that the two trails must be connected, both to bolster healthy recreational opportunities and to attract tourists. Rita Horsey was one of just a handful of residents to speak adamantly against the possibility of using eminent domain for this purpose. After the hearing, councilors did not immediately take action on the matter but indicated they would continue their talks with McCrum. He said outside Belfast City Hall it is clear to him that there is passion on both sides of the issue.